If you are looking for 10", cheap yet good tablet pc, you might want to consider Coby Kyros MID1045 from Coby Electronics. It runs Android 4.0 Ice Cream Sandwich. 1 GHz processor and 1 GB of RAM. It is Wi-Fi only, but have HDMI, so you can connect it to your HDTV. Internal storage is only 8GB, but expandable with optional microSDHC card, up to 32 GB. Well-built and fitted with hardware to conveniently stream and transfer multimedia files—not to mention reasonably spec’d—the Coby Kyros MID1045 is, without a doubt, an absolute steal. 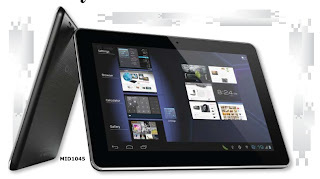 It’s an easy, 10-inch pick for consumers who want an inexpensive Android ICS experience without breaking the bank. Priced $269 in U.S. you might want to check out this tablet. It is available from MCM Electronics. For a quick preview you may want to check out the article from TEMPO, a Phillipine Newspaper by clicking here.